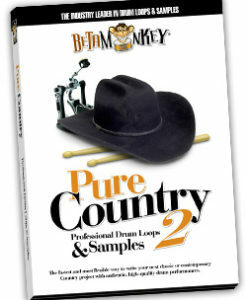 Need country drum loops for traditional as well as modern styles of country music? For modern and traditional country drum tracks, the Pure Country Series offers the right grooves for country songwriters. We’re talking shuffles, trainbeats, swings, brush work, sidesticking. If you write alt or classic country, bluegrass, country ballads, country-rock, and rockabilly, we have the right drums for your music. Unlike MIDI drum tracks, our downloadable sample packs offer songwriters 100% live acoustic loops and samples. Country artists can quickly and easily build drum tracks with the authentic sounds of Nashville. Sooner or later, your music will need 100% live drum tracks. 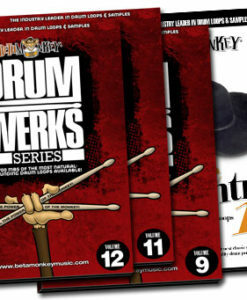 Get the drum loops for country that will get the job done right! All products are available for instant download. ALL 16-bit, 24-bit ACIDized WAV, APPLE/AIFF, and REX2 loop formats included with purchase. The perfect acoustic drum samples for country, folk, bluesy songwriters. If your music needs that Alt Country Nashville sound, Pure Country® II offers 700+ loops to inspire your next project. Live, gritty, earthly - if you're after live acoustic drums, this one is a great fit. Pure Country IV was recorded in Nashville and features 3/4 and 6/8 brush drum loops for multiple styles of country, folk, and bluegrass. We captured the subtle nuances of brush work in 3/4 and 6/8 time exclusively, giving users a powerfully focused collection of grooves, fills, one shots and single hit samples. Over 340 loops and samples.